Looking back at the evolution of App Store as it turns 10 this week, the folks over at Sensor Tower have shared the list of apps and games that have stayed the longest at the coveted No. 1 spot on the App Store charts. The firm’s App Intelligence data shows that since 2010, approximately 30,000 unique apps, both paid and free, have achieved this goal. 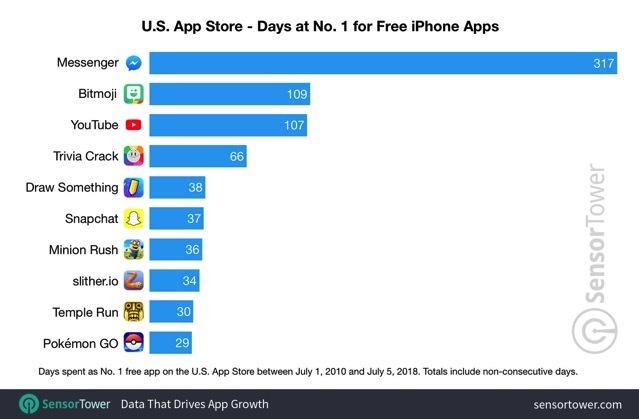 The above chart shows the apps that managed to spend the most time at the top spot in the United States. The data shows that 422 unique apps have reached No. 1 on the top free iPhone apps chart since July 2010. Facebook’s Messenger spent the most time at the top of this chart in the U.S. at a combined 317 days, followed by Bitmoji which remained at the No. 1 spot for 109 days. 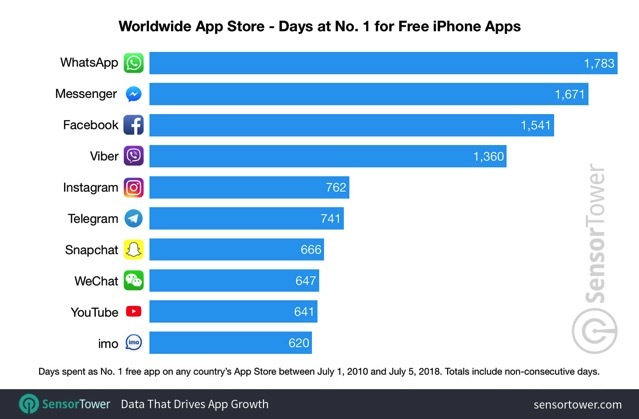 In terms of the worldwide App Store chart however (shown below), WhatsApp topped Messenger with a total of 1,783 days at the No. 1 position. Messenger, Facebook, Viber, and Instagram round up the top 5. For paid apps, Minecraft spent the most time at No. 1 spot on the App Store charts, both in the U.S. and worldwide, whereas Clash of Clans spent the most time at No. 1 on the top grossing chart. For more charts, check out the source page.